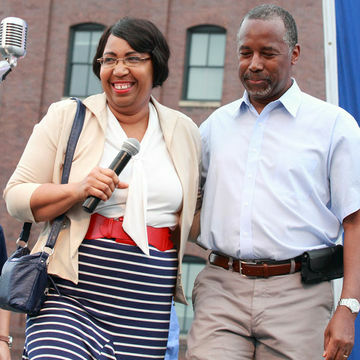 Candy Carson, wife of Ben Carson, released her memoir and has jaws dropping, thanks to a graphic description of her home birth story—but one expert is buying it. Ben Carson's wife, Candy Carson, just released a memoir, A Doctor in the House: My Life with Ben Carson, and while there were undoubtedly several interesting revelations detailed in the book, one OB-GYN is fixating on a specific story. In the book, Candy recounts the story of how she and her husband welcomed a child during a home birth—and while home births are not as uncommon as you might think, some parts of the story seemed a bit, well, unbelievable to one medical expert. Jennifer Conti, an OB-GYN and medical journalist, penned a piece for Slate evaluating the story and its credibility. Her verdict? Well...she's not saying the story is definitely false. Dr. Conti calls the story "insane" and we can't disagree. According to the memoir, Candy went into labor with their youngest son spontaneously, at which point her husband (who, let's not forget, is a neurosurgeon and not an OB-GYN) sprung into action. Dr. Carson allegedly caught both the baby and the placenta before sending Candy (who had just given birth, according to the memoir) off to fetch something they could use to clip the placenta. "Ben literally had his hands full so he told me to find something to clip off the placenta," Candy wrote in the memoir. Dr. Conti's thoughts on all this? "Sure, home births happen all the time in the United States, and yes, people who aren't obstetricians can definitely catch a baby in an emergency—although, let's be honest, you want a trained professional protecting that perineum. But—really?" she writes in her piece. Dr. Conti, who has delivered "hundreds and hundreds" of babies, questions how the baby and the placenta seemed to have come out at the exact same time. "Usually the mother delivers the placenta—which looks and feels like a giant uncooked steak—sometime after the baby's birth," Dr. Conti points out. "Almost-simultaneous delivery could be a sign of a placental abruption, in which case you've got yourself a true obstetrical emergency. You should probably drop everything and call 911, not go on a treasure hunt for a makeshift clamping device. Or at least you should send your husband to do this, because chances are you're hemorrhaging and probably shouldn't be running errands up and down the damn stairs. "Maybe the birth went exactly the way Candy describes it. If it's true, we just hope that Dr. Carson doesn't make his neurosurgical patients fetch their own surgical tools. And we hope the Carsons hired a really good house cleaner after this blessed event," Dr. Conti writes. So while we have no real way of knowing how true this story is, we can tell you one thing: Don't try this at home.